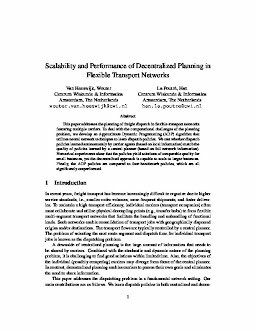 This paper addresses the planning of freight dispatch in flexible transport networks featuring multiple carriers. To deal with the computational challenges of the planning problem, we develop an Approximate Dynamic Programming (ADP) algorithm that utilizes neural network techniques to learn dispatch policies. We test whether dispatch policies learned autonomously by carrier agents (based on local information) match the quality of policies learned by a central planner (based on full network information). Numerical experiments show that the policies yield solutions of comparable quality for small instances, yet the decentralized approach is capable to scale to larger instances. Finally, the ADP policies are compared to four benchmark policies, which are all significantly outperformed.